ALEPPO, SYRIA (4:15 A.M.) – The Syrian Arab Army's Republican Guard, backed by Liwaa Al-Quds (Palestinian paramilitary), continued their large-scale advance inside the provincial capital of Aleppo on Sunday night, targeting new areas under the control of Fatah Halab near the Handarat Refugee Camp and Kindi Cancer Hospital. According to a military source in the provincial capital, the Syrian Armed Forces managed to capture the western axis of the Awijah District after a fierce battle on Sunday night with the jihadist rebels of Harakat Nouriddeen Al-Zinki, the Free Syrian Army (FSA), and Jabhat Al-Shamiyah. 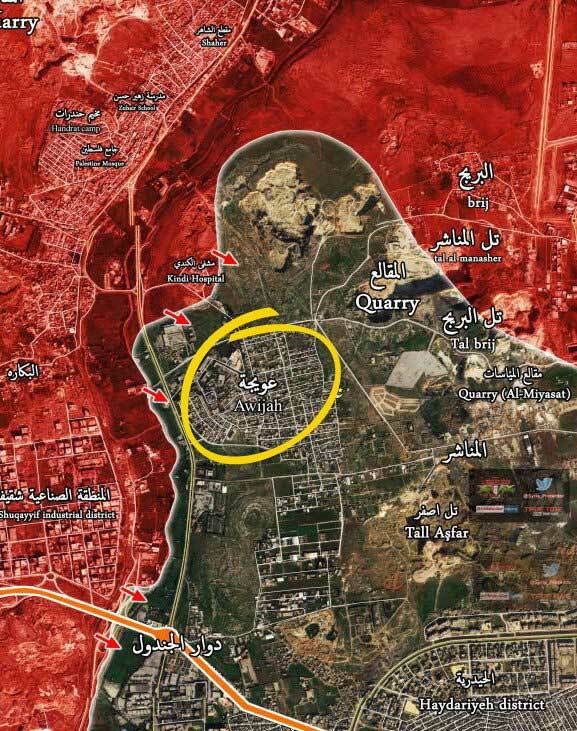 In addition to their advance at Awijah, the Syrian Armed Forces are also pushing towards the Bureijj Quarries, where they hope to expel the remaining jihadist rebels in the area. Intense clashes are still ongoing inside the Awijah District, as the Syrian Armed Forces continue their massive advance against the jihadist rebels in northern Aleppo.